Hair is an important part of our image. Almost every woman dreams of stunning and well-groomed long hair but it`s also a complex challenge to grow your hair under the shoulders and care it every day to have more than good but great look. If you aim at growing long hair and don`t want to spend much time doing it, you should know some top tips how to get thicker and longer hair in a short time. The health and length of your hair are directly dependent on the food you eat. Hair is mainly built up of protein so it requires protein for a shining look. A well-balanced diet helps you to get a wishful result but you should fill your plate with plenty of fresh fruit, leafy vegetables and the products that are high in protein as lean meat and fish, seafood, eggs and beans to ensure your hair with nutrients it needs to be strong and healthy. 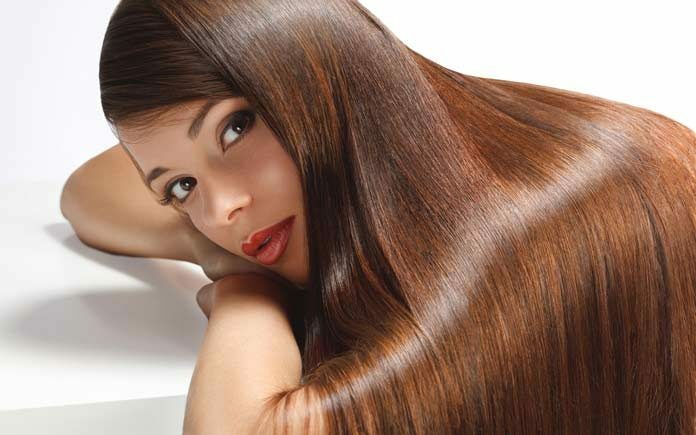 Certain vitamins can help your hair to grow faster like biotin, zinc, B vitamin etc. If you`re not sure that your diet includes all the vitamins that you need for faster hair growth you may use a variety of supplements but previously you should consult a specialist to find what tablets will work best for your hair. If you`d like to balance hair growth you mustn’t forget about trimming your hair – perfectly every six weeks. Regular trims will prevent damaged hair filled with split ends, breakage and thinning which are the main causes that inhibit the growth of hair. One more way for the stimulation of hair growth is to treat your scalp to a regular massage because it increases the blood circulation and as a result of it – the supply of nutrients to the hair follicles. Gently and slowly massage your scalp with the fingertips beginning from the center of the head towards the temples and then towards the back of the neck in a circular motion. Massage your head only with the fingertips, not with the nails which can harm your hair. Any stress affects negatively our health and the growth of hair particularly. Therefore, when you want to have splendid long hair you should exclude all stressful situations and always be calm and steady. Yoga, meditation and stress relieving exercises can help you to avoid stressful things in your life. Of course, you should sleep at least eight hours a day to be in good spirits and firm to any stress. Most women think that they look more attractive if they wash their hair every single day but it`s incorrect! Doing that you harm your hair and it can be the cause why your hair grows so slowly! Using the shampoo every day makes your hair drier and it loses most of its natural essential oils that help to keep hair moistened. It would be better if you revise your habits and try to wash hair four or five times a week. Now there are many different hairbrushes that can help you in everyday life to take care of your hair. But you should choose the best one for you that will help your hair to grow! It`s better to use a wide tooth comb instead of fine tooth brush as it will glide mildly through your hair and won`t pull at it! Andrew Guerra is the founder of TheHairStyleDaily. He likes to share his thoughts with the people around. His writing on beauty has appeared to make our life more amazing. Andrew believes that beauty will save the world.